Are you interested in a career in the sustainable energy industry? 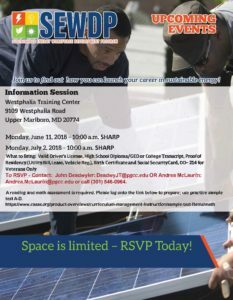 If so, the Prince George’s County Sustainable Energy Workforce Development Program (SEWDP) can help you reach your career goals! 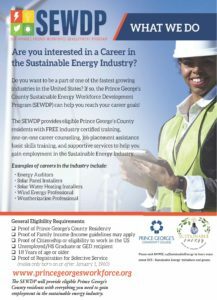 The SEWDP provides eligible Prince George’s County residents with FREE industry certified training, one-on-one career counseling, job placement assistance, basic skills training, and supportive services to help you gain employment in the sustainable energy industry.